YEREVAN. – The participants in the march, led by opposition Civil Contract Party Political Council member and National Assembly of Armenia “Way Out” (Yelk) Faction head Nikol Pashinyan, on Thursday are continuing their street protests in capital city Yerevan. They have reached Komitas Avenue. The Armenian News-NEWS.am reporter at the scene informed that the demonstrators are closely monitoring vehicles to make sure they are not driven without license plates, or with covered ones. Also, they call for immediate prevention of unlawfulness. Earlier, Nikol Pashinyan announced that they are temporarily stopping the blockage of Yerevan streets because vehicles without license plates—or with covered ones—had appeared in the city, and whose drivers were driving carelessly and putting people’s lives at risk. 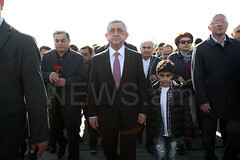 He called on his supporters to self-organize and not allow such cars to travel on the streets in Yerevan. After 11-day nationwide protest actions by the Pashinyan-led movement, ex-President Serzh Sargsyan on Monday resigned from his recently-elected post of Prime Minister. Acting PM Karen Karapetyan stated that Pashinyan had posited new, unilateral demands. 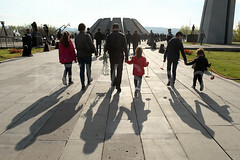 Nikol Pashinyan, in turn, announced that they are resuming their protests as of Wednesday, since the ruling Republican Party of Armenia wants to retain power at the expense of Sargsyan’s resignation.